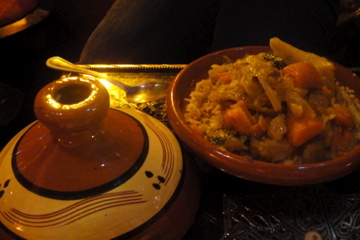 Granada is known for its Moroccan food– the falafels are the most talked-about, but its other offerings such as couscous tagines are also worth mentioning. Spain is all about pork products- they’re pretty impossible to escape. 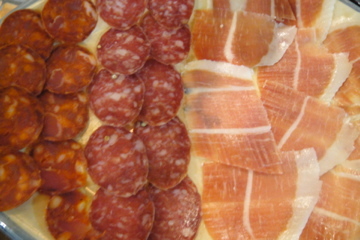 At La Oliva gourmet food shop, there is quite a variety to sample! 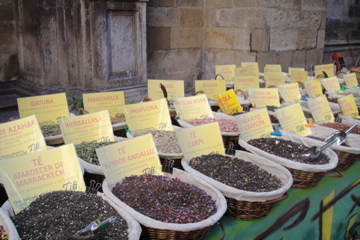 In the afternoons, market stalls are set up alongside the main cathedral in Granada. The baskets are filled with piles of spices, and as in the case of this picture, whole-leaf tea blends. The aromas are amazing! 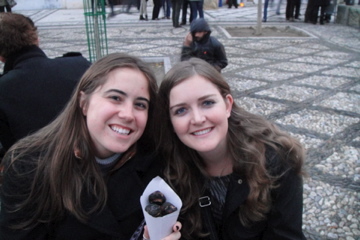 Come fall, the smell and smoke from roasting chestnuts fills the air in Granada, as well as Sevilla. The nuts are very filling, with a starchy, potatoe-esque texture and taste. We took this pic in the Mirador San Nicolás, which has the grandest view of the Alhambra, a continuous stream of street performers and chestnut roasters always near-by. With gray skies and a chilly wind, today seems to mark the end of the fabulous fall weather we’ve been having in Sevilla. I’m crossing my fingers it doesn’t rain since I have laundry drying on the roof!!! I hope everybody has a good day and stays warm! FIGURE OUT A WAY TO DEVELPOE IT !!!!! !